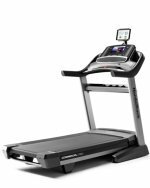 The Stamina InMotion Manual treadmill has two incline positions and folds down to a 17 by 22-inch footprint for easy storage behind a door or in a closet. Needless to say this is not the most advanced cardio machine on the market today...but for very light use or rehab purposes, it's not a bad choice. Plus, at just around $130 you absolutely can't beat the price! The battery-operated monitor has an LED window that shows time, speed, distance, and calories burned with a one-button control. Get the Stamina InMotion treadmill for under $130 on sale now! The Stamina InMotion Manual treadmill is “self-powered” which means the user’s walking stride is what moves the belt. There are two weighted flywheels on the roller to help make walking easier so you aren’t forced to exert force on the belt to get it to move. It has a textured, non-slip walking surface, and you can adjust the resistance (make the workout harder) by setting the height to the higher incline from 8 degrees to 10 degrees. This model is listed as being able to accommodate user weights up to 225 lbs but we would not recommend anyone over 170 pounds use this 50-lb machine since it won’t seem very stable. Another point to consider is that the monitor isn’t very accurate. Don’t count on the calorie count or the distance measurement to be accurate. The customer reviews have been largely mixed, with half of the users satisfied and the other half warning of annoying issues – such as the belt constantly slipping. If the belt has that much side-to-side slippage, where you constantly have to stop and adjust it several times during a 20-minute walk, it won’t take long before you get frustrated with this manual treadmill. Not surprisingly, the warranty is not too great on this one. You get only one year on the frame and 90 days on parts. But even if it only lasts the year, you're paying less than a dollar a day to use it...a real bargain. You have to cut a lot of corners to keep the price down on a manual machine but Stamina Fitness has a knack for doing the right things. It isn’t a quality machine by any stretch but is certainly usable for light use, it is very portable, and it is easy to assemble. At just $130, the Stamina InMotion Manual treadmill is an okay - not great, but better than expected - deal. 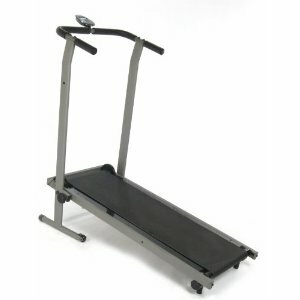 If you need something a little more advanced, take a look at some of the other Stamina treadmills on the market today. None of them are top of the line, but for a few hundred dollars more you can get a powered model with built in workouts, incline and some added features that you're not getting on this model.